In the coming decades, Europe is expected to have fewer Christians and more Muslims and other religious minorities, according to Pew Research Center projections. But while these changes will be significant, they will not radically alter the continent’s religious composition. Largely due to low fertility rates across the continent, Europe is the only region of the world where the overall population is projected to decline in total number (by almost 50 million) between 2010 and 2050. The number of Christians in Europe is forecast to drop by about 100 million, from about 553 million to 454 million, and an increasingly small share of the world’s Christians will live in Europe. Still, in 2050, almost two-thirds of all Europeans (65%) are expected to identify as Christian (this does not imply that most will be regular churchgoers). By contrast, roughly three-quarters of Europeans identified as Christian in 2010. Christian declines in Europe are expected in part because Christians on the continent are older than other groups, with a median age of 42 as of 2010. By contrast, Muslims have a median age of 32. The projections for Christians also factor in religious switching, the largest consequence of which is net movement of people leaving Christianity and joining the ranks of the religiously unaffiliated. The share of people who do not identify with a religious group is expected to grow from 19% of Europe’s population in 2010 to 23% by 2050. The Muslim population will grow, from about 43 million in 2010 to 71 million by 2050, according to the projections. But despite the concerns of some Europeans, Muslims are forecast to increase only modestly as a share of Europe’s population, from 6% in 2010 to 10% in 2050. Muslims are expected to grow in Europe because they have a younger population and a higher fertility rate (2.1 children per woman) than any other major religious group. Furthermore, ongoing immigration from the Middle East, Africa and Asia is expected to stoke growth. 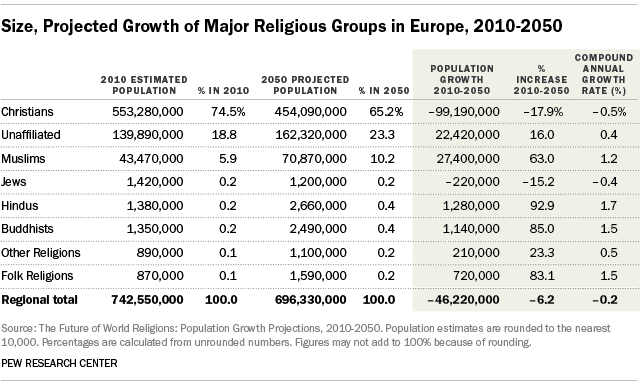 The populations of other, smaller religious minorities also will increase, although in each case from a much smaller base than Europe’s Muslims. For instance, Buddhists and Hindus are expected to double as a share of Europe’s population – in both cases rising from 0.2% to 0.4%. The population of those in Europe who identify as Jewish by religion is projected to continue a long decline in the coming decades, falling from 1.4 million in 2010 to 1.2 million by 2050, remaining about 0.2% of all Europeans. Moreover, Jews will no longer be Europe’s second-largest religious minority after Muslims. By the middle of the century, there will be roughly twice as many Hindus (2.7 million) and Buddhists (2.5 million) as there are Jews in Europe.